All aboard the interactive talking bus! You can select your destination from school, zoo or train station to hear sing-along songs or fun phrases! Giggle as you press the smiling passengers, who are ready to greet you with humorous sayings! 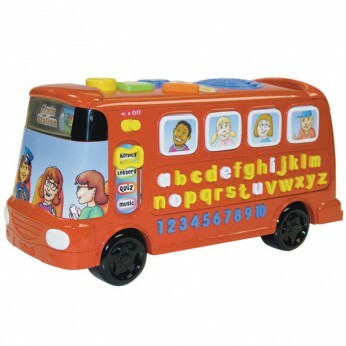 Interactive talking bus teaches phonic sounds, letter names and numbers and features 26 raised letter buttons to encourage letter recognition, language development and independent play. Includes fun character buttons, destination selector, colour and shape buttons. Features a wide selection of musical melodies in various styles and fun sound effects including horn, brake and accelerator! General information: Batteries required: 2 x AA (included); For ages 1 years and over; EAN: 0050803648039. WARNING(S): Lion Mark The Lion Mark is a symbol of Toy Safety. All our toys are tested for compliance with exactly the same approved safety standard. Little ones can take a ride on the VTech Playtime Bus with Phonics to learn all about letters and numbers!Cool features on the Playtime Bus include:Phonic sounds to help children learn how to pronounce letters and wordsChunky buttons which are ideal for small handsFun vehicle sound effects including horn, brake and acceleratingSmiley passengers say funny phrasesMusical melodiesVolume controlAutomatic shut off to save battery lifeA durable design means that little ones can sit on this 17cm tall and 33cm long bus.This brilliant toy is perfect for children aged 12 months and up. It comes with 2 x AA demonstation batteries but we recommend you get more as these might not last long!Children will enjoy lots of educational fun with this interactive V Tech Playtime Bus. Great fun to play with, this little playtime bus offers different ways for children to learn the alphabet, and the shapes of the letters.This interactive talking bus teaches phonics, letter names and numbers through 4 modes of play.Shaped letter keys teach kids the alphabet as they playChunky buttons on the top of the bus call out shapesA friendly English voice teaches the letter soundsRealistic sound effects and 10 popular melodies make learning fun! This toy costs approximately £17.99 (for the latest and best prices make sure you check our retailer list for the VTech Playtime Bus with Phonics above). In our review of VTech Playtime Bus with Phonics we classed it as being suitable for ages 1 to 3 years but recommend you check the manufacturer specific advice before purchasing.